Today I wanted to start something new but what I hope I can do every now and again. I spend a lot of time reading blogs so I figured I could sometimes share with you a few bits and pieces that stick out in my mind. A couple of these were guest posts which I think are such great ways to find new blogs that you might not have come across otherwise. 1. First off and most importantly considering what day it is, I couldn’t help but include this really well written post by Madicattt on the way that history is conveyed in a very skewed way, exemplified by Waitangi day and the ignorance most people (including myself) often have about the background and history behind the holiday. Maddy’s blogs are always well thought out and opinionated and give the reader a chance to learn about the other side of the story. I wish I could write (or think) half as well as she can! 2. From the political to the pretty, here is the blog where I get my work wall papers each month. Love Mae is a blog as well as a store full of crafty pieces that I continuously browse through. My favourite part though is changing my desktop each month to the beautiful monthly designs. 3. 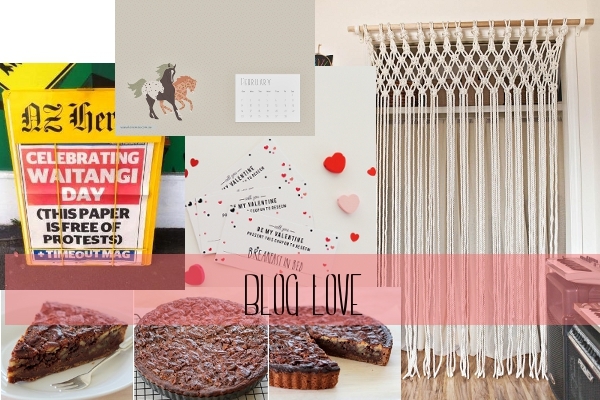 The Dizain Collective is one of the first blogs I check daily and is always full of beautiful mood boards, delicious recipes or in this case wonderful guest posts featuring incredibly cute Valentine’s day printables by Lovingly, Kate (a wonderful blog which is where these were originally featured) . If a big present isn’t your thing these gorgeous vouchers are the perfect gesture and a fun way to make Valentine’s day more personal. 5. Last but not least, if baking is your thing (or you have a friend who will bake stuff for you) then take a look at this recipe for Chocolate Praline Pie. Yum. High Tea with Dragons is one of my favourite baking blogs and this guest post by Melissa from Baking Makes Things Better looks absolutely delicious (and has given me a new blog to add to the list of must reads). I have been drooling over that pecan pie ever since I fell across the recipe earlier this week!